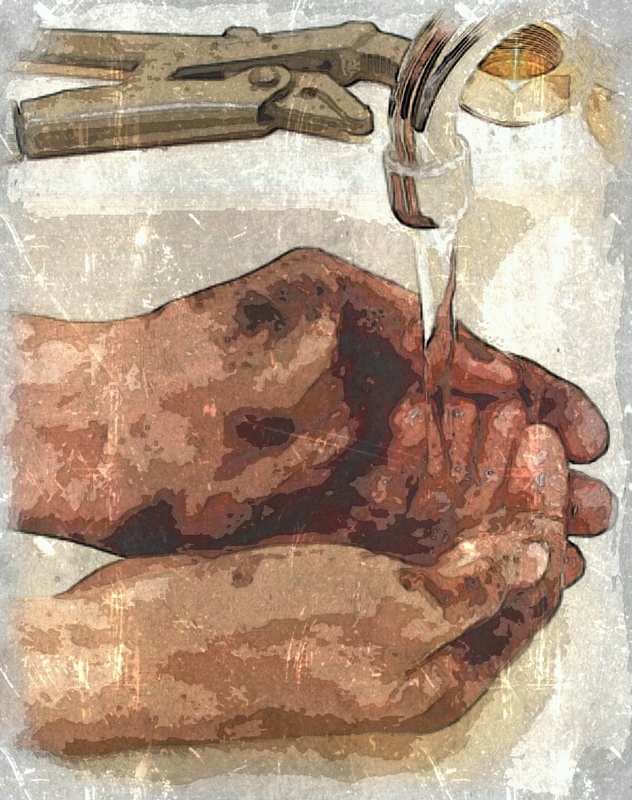 YOU CANNOT CLEAN your hands in dirty water – 0h, and how long I had been trying. All that scrubbing, inspecting my only skin under all the light, all that soap, lathering up into a froth, until every speck of dirt was purged into the filthy basin that looked so pristine once, slurped at by the gurgling spoked sink hole. Turning the tap off, I dared to look in the mirror dappled with toothpaste and flossing collateral. I dry my hands and look at them, front and back, with a detachment as if viewing exhibits in a museum of sickness. Nobody ever told me, you can’t clean your insides but I tried. I’d been bleaching the hallways of my within vicariously, gallon barrels kicked over, scorching through the dead life, cleansing with harsh notes, a burning sensation without degrees. And so I stood outside, with clean hands and a book – of matches. The quickest quick read. With the reek of petrol fresher than destruction coating the paintwork of the building, I lit three on the strip, tossing them into the flammable. With each change in colour I felt cleaner, and by the time the building caught the entire attention of the fire, my mind felt lighter as demons exited through solid bone. Burn in hell is a common phrase. Seems a little distant. Now is better. Patient confidentiality with my psychologist, let me tell the stories. I think they were eager to assist me now we had worked through several sessions. Eager was the wrong word – perhaps, bound? Underneath my confessions, I sensed fear. Of their workplace. Of their car. Of their possessions, all going up in smoke. And I learned every issue I had could be neatly summarised into one word: transference; my inner fury had to have an outlet, I had to get clean somehow – fire – the other soap. Fixing years of damage would not be easy Dr. S. Galloway assured me. It would be a long road to recovery. All I could think was, are roads flammable? And just another amazing story as I step into your place! Wish I was back earlier and read is sooner. As always, Lion, brilliant as always! Even though we never learn what the problem is, it doesn’t matter. Wowza!! Sizzling work! Grabbed me from start to finish. A fire pit of the soul. Visit the Lion’s blog if you want to read about and learn from some cool and very well written insights….if you dare. The therapist feels obliged by fear if nothing else to continue helping…a sort of in too deep scenario. You are the lion king of surprising endings. I did not see the fire coming until it burnt the page. Fantastic write – and read! This has to be your most powerful write to date. Great message, nailed it with the finale. BRAVO. Mega thanks LA, that means a lot, especially from yourself. Another short hit, well done 😊. Intentionally using the fact that arsonists are more likely to have suffered an abusive childhood, hence the washing and bleaching and therapy? Or a spookily profound bit of insight? This story came to me quite organically, its hard to out my finger on the intentionality, but I would imagine someone predisposed to burning and destruction would have plenty unresolved issues. I loved the seamless transition from soap and water to fire. A scary, believable story! That had a nice dose of sardonic muse at the end and the creepy fact of all those holding said keys, are they safe? Loved the intro and a thorough building of the characters flaws and insecurities and psychiatric potential, and lo…there he was. And so short – I read short stories that are flat and with nothing in them, hence their length so, amazing, again. Seriously! I was hooked from the first line and as the story progressed, I loved how you introduced the element of fire. If water doesn’t clean, fire’s the next best thing right? Fantastic job!! Wow! You did it again: goose bumps all over me, especially at the end! Great short story, Lion – as it is always the case!! You´re very welcome, Lion! 🙂 Have a great weekend!